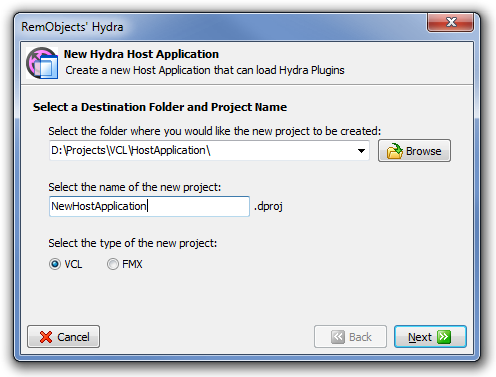 A Hydra host is an application that provides the ability to load (host) and use the exposed functionality of a plugin. 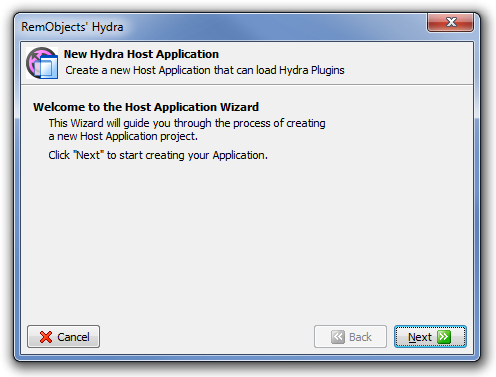 Host applications are able to use all plugins supported by Hydra. VCL is a visual component-based framework, and one of the most used types of host applications. It also is is our oldest supported framework, so there are some features that are available for this framework only. In this article, I will describe how to create a new VCL host application, and talk about what features it provides and how they can be used. 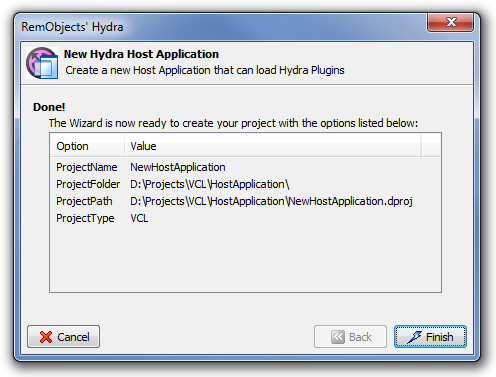 Creating a Hydra host is a very simple process which is entirely automated by our IDE wizards. The wizard allows you to choose between FireMonkey and VCL frameworks; to create a VCL host you will need to select the VCL option. I will describe how to work with runtime packages later in this article. Project file - The wizard will create a *.dpr file and, if needed, additional project files (like *.dproj). This is a regular VCL project file, the wizard doesn't add anything specific for this one. As you can see, this pretty much looks like a regular VCL application. The wizard added some units into the uses section, which contain definitions for the most common items, like interfaces or enums. It also added a definition for the module manager. I will describe how to work with the module manager later in this article. The host application is a common VCL application, the main form generated by the wizard is inherited from the standard TForm and provides exactly the same design surface, so you can work with the host application like you do with any regular VCL application. Please follow the links to learn more about these features. CreateInstance - Creates an instance of a plugin with a specified name. CreateInstance returns a reference to an IInterface, however, you can also use the CreateVisualPlugin or CreateNonVisualPlugi methods to create a specific plugin. ModulesToLoad and AutoLoad - The first is a string list that allows you to define a list of modules that can be loaded, the second defines whether they will be loaded automatically after the module manager is created. As you can see, the module manager provides a couple of methods that allow you to access the modules and descriptors. So let's find out what this means. Every plugin that was loaded by the module manager is represented by a special class that describes this module. All modules are descendants of the THYModule and allow you to get access to module data. Plugin descriptors are used to describe a plugin that is stored in the module. In most cases, you will use the THYPluginDescriptor class to deal with the descriptors. The THYModuleManager itself implements a couple of base hosting interfaces to be able to deal with plugins, and provides a couple of ways for you to expose your own methods or properties to plugins. First it checks if it already implements the requested interfaces, this is for general interfaces like IHYCrossPlatformHost. If the plugin requests a different interface, and if ResolveInterfacesToOwner is enabled, it will request its owner to resolve the interface. fVisualPlugin: IHYVisualPlugin; - This is a reference to an instance of the plugin. You can use it to perform any specific actions with the plugin. You need to keep this reference alive until you use the plugin and release it when the plugin is no longer needed. ModuleManager.LoadModule('ModuleName.dll'); - This method allows you to load a plugin module with a specified path. Module manager will automatically detect the type of the module and will use the appropriate method. Module manager also provides a couple of methods for module loading, such as loading from a list of file names or loading using a search pattern. ModuleManager.CreateVisualPlugin('VisualPluginName', fVisualPlugin, Panel1); - This method will create an instance of the plugin with the specified name and assign this instance to the fVisualPlugin variable that we defined above. This method can also show plugin content in a container that in this example is represented by Panel1. Please note that this method is only used for creating an instance of a visual plugin, for non-visual plugins you can use ModuleManager.CreateNonVisualPlugin. ModuleManager.ReleaseInstance(fVisualPlugin); - Releases an instance of a plugin. Please note that you must release an instance of a plugin before the plugin module is unloaded. ModuleManager.UnloadModules; - This method unloads all modules that were previously loaded by the module manager. Module manager also provides methods for unloading a specific plugin by its file name or index. Please note that there is no need to call UnloadModules on application end since module manager will do this operation on its own destruction. This is it, with just a few lines of code, the host is able to load, create and show your visual plugin. Hydra provides an easy way to enable runtime package support for your project by using the Project Package Settings dialog, as described here.